The “Moonbeam of Five” or “Moonbeam III” was commissioned by the lawyer Charles Plumtre Johnson, initial owner of the other four designed by the Fife family. William Fife was the responsible of building the first of the ships known as Moonbeam, a series which design and facilities improved the previous one. 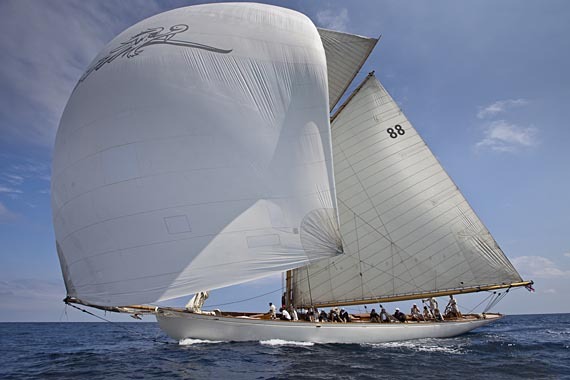 In 1903 the Moonbeam III is built, which was moved to Cannes in 1920 in order to stay in that harbour. After being owned by many different people, in 1989 it was sold in a Sotheby’s auction, and in 2000 was acquired by its actual owner, Didier Waetcher, who threw a big party for the ship’s century in 2003. Erwan Noblet, the Moonbeam III’s skipper, showed his satisfaction for winning the last edition of this race, which meant an “improvement for the ship’s reputation and real value because it had been demonstrated that it was still alive and could win a competition”. An evidence that in the IV edition has been confirmed thanks to its victory in the Big Boats category.